BMW M5 review | What Car? What is it? It may not look that different to a common-or-garden 520d, but be under no illusion; this is a 5 Series with the power to lay waste to all but the most outrageous supercars. Welcome to the all-new BMW M5. What's it like to drive? The latest twin-turbo 4.4-litre V8 engine may be two cylinders and 600cc short of the previous M5's 5.0-litre V10, but it has more than enough mumbo to satisfy wealthy adrenaline junkies. Maximum output is up 45bhp and now peaks at 552bhp, while torque takes an even more significant leap to 502lb ft (the previous car made do with 384lb ft). 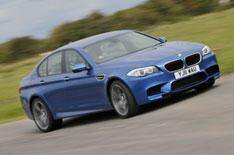 It's the immediacy of that torque that's key to the latest M5's devastating speed. Even gentle throttle pressures unleash a huge surge of power. Take a less-sensitive approach and things go from merely rapid to downright rabid, as the acceleration just keeps on coming right up to the 155mph limiter. Were the M5 stripped of its electronic governance, it would keep on going until 190mph, reckons BMW. Given the standard Five's rather languid handling, the good news is that the M5 is an entirely different proposition. Some of the improvement is down to bespoke adaptive dampers and the absence of the stiff-walled run-flat-tyres that are standard on lesser versions of the 5 Series. However, the biggest contributing factors are the beefed-up front suspension struts, which are connected to the chassis by a heavy duty cross-brace, and the M Differential. Together, these help reign in body roll and aid high-speed changes of direction. Even so, the M5 is not what you'd call a nimble car, largely because you can't argue with physics. It's big and heavy, and so often feels a bit of a handful, whether you're hard on the throttle or hard on the brakes. The dual-clutch gearbox is great, though. It makes near-instant full-throttle upshifts, and is infinitely slicker than the old single-clutch robotised manual 'box. It's especially good when you're just mooching around using the full auto setting. Of course, for many, half the appeal of the M5 is its ability to carry four people in comfort, and here the M5 does the business. Hit the motorway with the softest suspension setting selected, and the ride quality and overall refinement border on the standard you'd expect from a luxury car. If theres a downside, its noise. Those fat tyres generate a fair bit of racket and theres a deep exhaust boom at 4000rpm, although youll never hit those revs in top gear in the UK. What's it like inside? Given the price, you'd be appalled if the M5 didn't come specced to the gunwales. You needn't worry. A full leather interior and bespoke sports seats are notable high points, while a large head-up display and BMW's iDrive control system allow you to spool through the myriad infotainment menus without tearing your gaze from the road ahead. There's also a horseshoe arrangement of switches clustered around the gearstick that allows instant access to gearshift-speed, suspension and steering-weight settings. Additionally, there are two M buttons located on the fat rimmed steering wheel. Each of these can be programmed through the iDrive to give separate comfort or performance settings at the press of the appropriate button. The interior finish isn't really that different to that of a standard 5 Series, but that's no bad thing because it means all the materials are classy. The quality of construction is beyond reproach, too. Should I buy one? As utterly beguiling as it is, the 73k M5 is a seriously expensive 5 Series. Running costs aren't for the faint-hearted, either, even though BMW has pulled out all the stops to maximise fuel economy. Whereas the old M5 was credited with an average fuel consumption figure of 19.1mpg (and in reality you were lucky to see 15mpg) BMW is confident that the new car will average 28.5mpg when driven conservatively. Ultimately, though, the M5s problem is that its almost too fast, too competent, too aloof. For 8k less you can have a Jaguar XFR, which is smaller, more nimble, almost as quick and more engaging at sane speeds.